Free response questions help the examiner to assess your standard from different angles and to some extent the evaluation will be subjective. But you can rest assured that the questions are so set that they are as specific as practicable. You must be very careful in presenting your answers in respect of free-response questions. Since the words “determine”, “derive”, “calculate”, “ justify”, “explain”, “what is”, “sketch” and “plot” have precise meanings in the AP Physics examination, you must thoroughly understand their significance so that you can give enough details wherever required and refrain from giving unwanted details where they will be sheer waste of time. 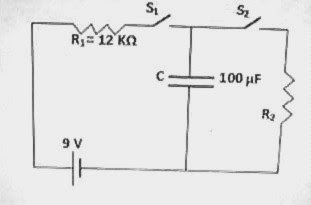 Here are two typical free response questions on direct current circuits. The first question is meant for both AP Physics B and C while the second question is meant for AP Physics C only. 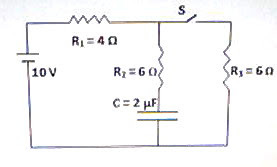 (1) A 10 V battery of negligible internal resistance is connected in series with a 4 Ω resistor R1, a 6 Ω resistor R2 and a 2 µF capacitor C as shown in the figure. A series combination of a 6 Ω resistor R3 and a switch S is connected across the series combination of R2 and C. The switch S is initially open and the battery has been connected for a long time. The above question carries 15 points. (2) In the adjoining figure the capacitor C is initially uncharged and the switches S1 and S2 are open. The battery has negligible internal resistance. This question carries 15 points. Try to answer the above questions. I’ll be back shortly with model answers for you.